The Time Magazine cover photo illustration depicting the sobbing child looking up at President Trump is horribly exploitative of the child. Time Magazine cover vs. original news photo. 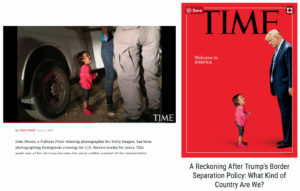 But just as bad is Time Magazine taking a credible news photo and cutting out the child to create the illustration. Chopping up a legit news photo to create a photo illustration is bad because it blurs the public’s view of the line between reality and photoshopped images, which in turn erodes the credibility of not just photojournalism, but journalism as a whole. Society needs to trust that the photos they are looking at are the truth. If Time is going to consider themselves as a news magazine, they must not alter the truth. They have obviously not learned from their past lapses in judgement. But Time made this assault on the credibility of journalism much worse by using this news photo for the purpose of a political statement. Taking hard news photos and using them like this bites at the credibility of our profession. Getty, Associated Press, Reuters and all the news agencies that distribute photos need to take some responsibility and make it clear that the news photos that photographers have entrusted to them to distribute throughout the world should not be used as political statements, especially under the guise of being a “news magazine.” Photojournalists also need to understand why they should not let their news photos be “chopped up” and used for political purposes or editorial opinion statements. Frankly, the image has a more profound message on it’s own. With the help of Trump, the credibility of journalism is under attack now more than ever. Drawing a line in the sand between real and fake is not good enough anymore. Maybe it’s time to build a wall that is bigger, louder and defines the border between credible and unethical more clearly.